If you are shown the offer, click on the green button to receive it for free. Once you receive it, you can find it in My Badges in your latest Mix-n-Match album, or on the Payday FreeCell page under the Challenges tab. 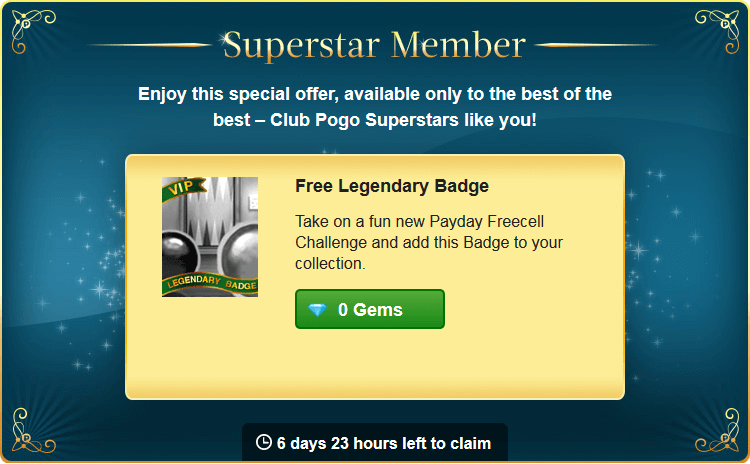 TY for my free badge Pogo! Got it! I got my 8000th badge last night! I remember when 1000 seemed crazy to me. Congrats & Welcome to the 8K Club!! Oh, 8000! WOWZER…Big, Big CONGRATS!!! Congrats on reaching your 8,000! Got mine. Thank you Pogo. I love Payday Free Cell, and I’m a Superstar again, have gotten them all so far, I hope you all did, too!! Yes I got mine too . Thank you Pogo. Got mine. Finished it quickly. Thanks Pogo!! It is simply beautiful here today. A nice welcome to see the sun shining and flowers popping up. Got it and looking forward to doing it. I received the SuperStar offer, Thank You very Much Pogo!!!! Superstar! I like playing the game, so happy to have it! Congrats & Welcome to the 6K Club!! I got the offer but didn’t take it as I don’t like the game and I didn’t know what the requirement were to do it. Could someone tell me what is needed for this badge and maybe it will be something I can do. Thanks for all the information. Just take a look at the article above. Sorry Moms I didn’t know which one you were reffering to. Since I didn’t accept it …it doen’t show up anywhere that I can find. You asked what the requirement was for earning the badge, and I directed you to the article above that contains that information. If you didn’t accept the offer you will have to wait 24 hours for it to appear on your homepage again. You simply have to win 4 games in 2 weeks. I got mine in less than an hour! I was very lucky! Good luck to you. Congrats on reaching your 6,000+! Nice surprise. Thank you, Pogo! Yay – I got it but have no clue why! Thanks, Pogo. This badge is so strange looking, I can’t remember what the original challenge was or the game it was in. Anybody remember? Probably Backgammon b/c that’s the board for the game. Move 50 of your opponent’s pieces to the bar in 2 weeks! Win this badge plus 1,400 tokens. Got it (and don’t know why, lol)……but as usual, I never know where to find it. Thanks to you folks, I found it but no clue what the free mini is. There were a few, but none in those rather awful Payday Freecell outfits grin. Anyone help by telling me if I have it as I did take all the freebies…….oops, forgot to check out so guess I lost the lot and will have to do it again. Colour me blonde today…..the weather is HORRIBLE!!!!! ICE STORM coming into Toronto and all of Ontario and driving is a distinct NO-NO!! But my neighbour got out via Air Canada this morning for Barbados……sigh. Hope we keep our power……. (we call it hydro). There is no mini item. It was just the badge. Pogo uses the same confirmation pop up for badges and mini items, but we only one at a time. Thanks Suz….I wondered how on earth one clicks on both items…….and as usual, you are the “lady with the answers”. I found the badge OK and am working on it. There is a lot of static on the radio at the moment, so figure our power is getting dicey. Got the tablets charged, but last week our power was out for internet for 7 hours and that was SO BORING!! Can’t believe we have this ice storm coming in and it is the middle of April!!! Hope your power doesn’t go out! I got mine! I finished it in less than an hour! It was fun! Thanks pogo! I thought maybe they chose the ones who get the badges by the gems they buy, but who knows? Maybe ones who play a lot. Believe this is the first one one ever that I haven’t gotten. No problem as I will get it when it is released. LOL Good luck to all who will play it. I got it also! Makes me happy when I get a VIP. Yeah!!!! I am a Superstar. thank you pogo for the gift. I have played and won four games but have not received the badge. Hope it comes soon. thank you again. Got mine also. Thanks Pogo! I received mine. Thanks for the free gift.